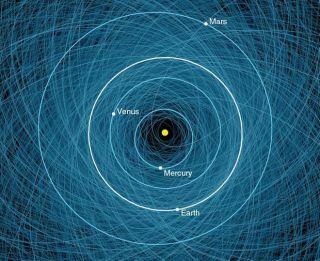 This graphic shows all of the potentially hazardous asteroids (and their orbital paths) around Earth (not to scale). As of 2013, scientists had counted over 1,400 of these potentially hazardous asteroids. NASA and other organizations do regular scans of the sky to catalog any small bodies that are at risk of crashing into our planet. No imminently threatening bodies have been found yet, but it's clear that sooner or later Earth will be struck by something big. The organizations are actively researching the best ways to protect Earth from asteroids, meteoroids or comets that may come crashing down. NASA's Center for Near Earth Object Studies and the International Asteroid Warning Network list recent "close calls." Asteroids refer principally to small, rocky bodies. Comets contain more ice and can also pose a threat to Earth. Before fragments enter our atmosphere, they are known as meteoroids. During their path in the atmosphere, they are called meteors. If any of these pieces reach the ground, those pieces are called meteorites. The best hunting ground on Earth for meteorites is Antarctica because the ice makes it so easy to see the fragments, and the ground is not disturbed as much as a typical urban area or forest. The difference between a meteoroid and an asteroid is a little vague. In 1961, The International Astronomical Union (the official body for naming objects in space) said a meteoroid is much smaller than an asteroid, but bigger than an atom. A 2010 Meteoritics and Planetary Science paper led by Alan Rubin, a geophysicist at the University of California, Los Angeles, suggested that the limit for meteoroids be about 1 meter in size. It's common for smaller bodies to escape notice until they are right beside the Earth, or slamming into it, because Earth's telescope network is designed for spotting asteroids of a much larger size. This is why in June 2018, for example, an estimated 6-foot (2-meter) rock called 2018 LA was found only a few hours before incinerating in the atmosphere. Keeping track of these bodies is also difficult, due to their size and low reflectivity — as well as limited telescope time. In mid-May 2018, astronomers with the Harvard-Smithsonian Center for Astrophysics lost roughly 11 percent — or 900 near-Earth asteroids — of the over 17,000 candidates identified between 2013 and 2016, according to Newsweek. In other words, after the initial sighting, scientists lost track of where these asteroids moved next. In 2017, scientists confirmed the first interstellar asteroid, which was known 1I/2017 U1 'Oumuamua. The interloper quickly zoomed through our solar system, showing its origins by its unusual path as it traveled by Earth at a safe distance. Scientists continue follow-up studies on the data, such as this 2018 study showing that 'Oumuamua is tumbling. A 65-foot-wide (20 meters) asteroid exploded without warning over the Russian city of Chelyabinsk in February 2013, blazing a superbright trail across the winter sky. It is clear that even small bodies can pose a threat; the asteroid that broke up over without warning over Chelyabinsk, Russia, in 2013 was roughly 56 feet (17 meters) across, shattering glass and injuring hundreds of people. In 1908, an estimated 130-foot (40-meter) object exploded over Siberia and flattened trees over 825 square miles (2,137 square kilometers). Around 50,000 years ago, before human civilization began, a rock about 150 feet wide (46 meters) smacked into what is now called Arizona. It left behind Meteor Crater, which is roughly 0.7 miles (1.2 kilometers) wide today. Even bigger collisions happened far in the past. The dinosaurs were wiped out 66 million years ago by an object about 6 miles (10 km) wide, which left behind a 110-mile (180 km) crater in Mexico known as Chicxulub. But that's nothing compared to evidence of another impactor found in 2014. A rock formation in our planet's crust pointed to a possible impactor 23 to 36 miles (37 to 58 kilometers) across that smacked into Earth 3.26 billion years ago, just a few million years after life evolved. NASA began tracking near-Earth objects (NEOs) in the 1970s. Its goal is to find objects that are at least tens of meters in size, "which could cause significant harm to populated areas on the Earth if they were to strike without warning," NASA stated in 2014. Congress directed NASA in 1994 to find at least 90 percent of potentially hazardous NEOs larger than 1 kilometer (0.62 miles) in diameter, which NASA fulfilled in 2010. Congress also asked NASA in 2005 to find at least 90 percent of potentially hazardous NEOs that are 140 m (460 feet) in size or larger. That's supposed to be finished by 2020; multiple media reports indicate NASA will miss that deadline due to funding challenges, although NASA points out its pace of discovery is accelerating due to better observatories NASA created a Planetary Defense Coordination Office in 2014 — a year after Chelyabinsk — to better coordinate its efforts, in response to an Office of the Inspector General report. Other space agencies such as the European Space Agency also have their own offices, and the different nations regularly collaborate with each other. NASA does regular "tabletop" exercises with its partners (such as this 2017 one) to simulate threatening asteroids and an appropriate response. An artist's concept for the Asteroid Impact & Deflection Assessment (AIDA) mission led by the European Space Agency to intentionally strike an asteroid and test deflection capabilities that could protect Earth. NASA works with several sky surveys to maintain a list of potentially hazardous objects. These include the Catalina Sky Survey (University of Arizona), Pan-STARRS (University of Hawaii), Lincoln Near-Earth Asteroid Research or LINEAR (Massachusetts Institute of Technology) and Spacewatch (University of Arizona). These observatories are constantly upgrading their capabilities to try to catch fainter asteroids. Asteroids are also observed from space by several telescopes, but the one most regularly used for NEO searches is called NEOWISE. It's the new mission of the Wide-field Infrared Survey Explorer (WISE) telescope, which launched in 2009 and was revived from hibernation in 2013 to search for asteroids. The telescope is expected to keep operating until 2018, when the angle from the sun in its orbit will be too bright to search for asteroids. In April 2018, the mission released a fourth year of survey data, including information on 788 near-Earth objects and 136 comets. A follow-up mission called Near Earth Object Camera (NEOCam) was proposed for 2021, but it lost out to other missions. NEOCam received another year of funding and may compete in future mission proposals. NASA acknowledges that with roughly two-thirds of the near-Earth asteroid population unknown, a NEOCam-like mission would be helpful. There are other NASA missions that are looking to get up close to asteroids to better characterize their composition. Some recent examples: The Dawn mission visited asteroid Vesta between 2011 and 2012, and has now been at Ceres (a dwarf planet) since 2015. OSIRIS-REx (Origins, Spectral Interpretation, Resource Identification, Security, Regolith Explorer) departed for asteroid Bennu in 2018 for a sample-return mission, which will come back to Earth in 2023. Additionally, NASA uses data available from other space agency missions that visited asteroids, such as the Japanese Hayabusa (completed) and Hayabusa 2 (in progress). A kinetic impactor (perhaps with a nuclear bomb inside) would deflect the orbit, tugging the asteroid slowly using a spacecraft, redirecting it with solar heat, or blasting it with a laser. That is just one idea. There is ongoing research as to what sort of asteroid deflection technique would be best. The best approach depends on many factors, such as cost, the composition of the asteroid, time to impact and technology maturity. Studies are ongoing in these fields; in 2007, NASA said that non-nuclear kinetic impactors had the most mature technology. In 2018, a group of U.S. scientists and engineers proposed an early-stage mission called HAMMER that would use a nuclear warhead to disintegrate large asteroids or move them off course.